Beijing-based MAD Architects have revealed designs for a roughly 657,000 square foot (61,000 square meter) headquarters for Chinese clothing designer and manufacturer Xinhee Group. 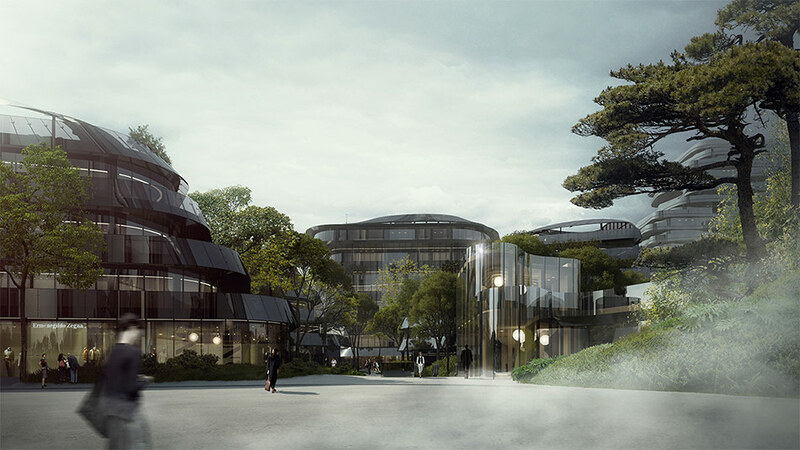 In their designs for the massive headquarters, the architects utilized the fashion group’s multi-brand corporate structure as a guiding principle, designing a six-lobed complex of buildings joined at a central atrium. Each lobe of the radially-organized plan houses one of the company’s six clothing brands, creating a unified whole from discrete working parts. 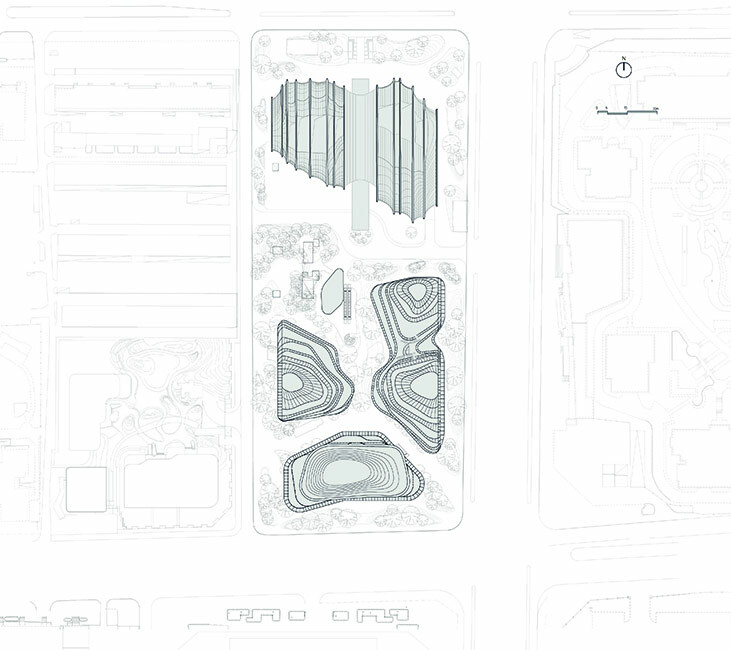 In a meeting with AN last month, MAD Founding Principal Ma Yansong relayed the inspiration behind the center as a blend between pragmatism and nature, with many of the aspects of the building pulling double-duty socially and environmentally. 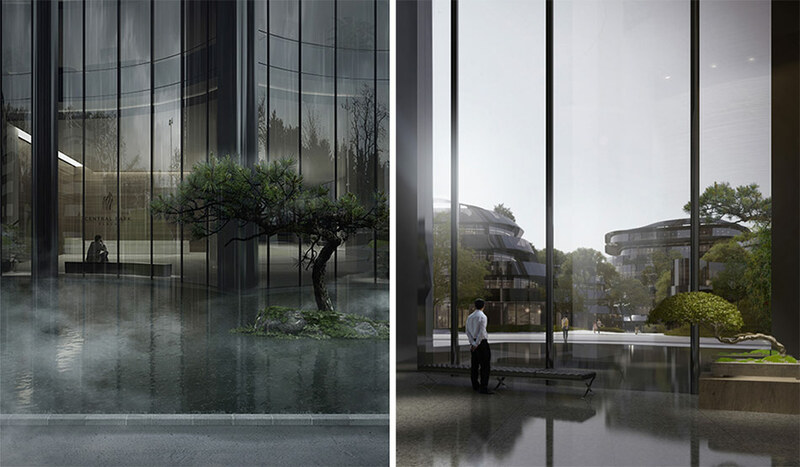 For example, the central atrium—which connects the various arms and employees of the company—allows the group to host grand fashion shows while simultaneously acting as a massive solar chimney for the building. 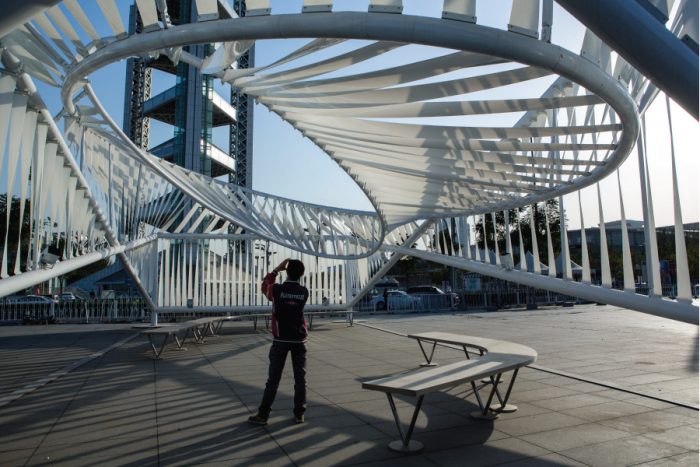 It pulls cool air from ground-level gardens up through the structure, carrying away heat and exhaust along the way. The structure’s sinuous floor plates seemingly dance around central cores contained within each of the six building sections. These floor plates vary in size and proportion across the complex, with some of the upper floors pulled back from the sloped facade, creating internal double- and triple-height spaces. The resulting array of stacked levels is clad in large sections of PTFE curtain wall panels that introduce dappled light. In the process, the PTFE makes the building appear lighter than it actually is. 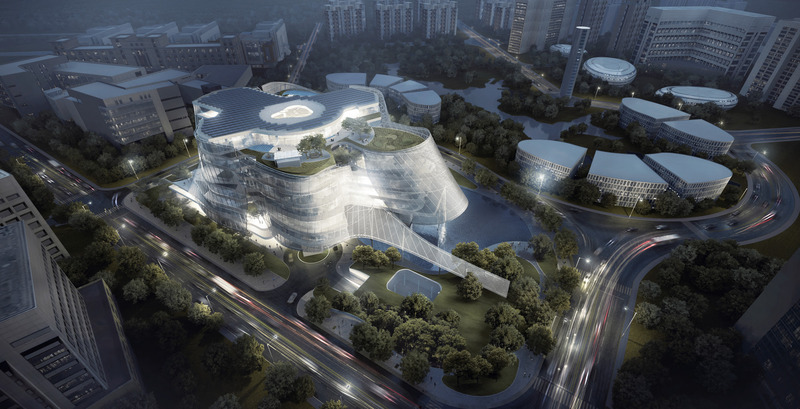 Yansong elaborated in a press release for the project, stating “It’s interesting for a building with such an intrinsically logical structure to look floating and free.” Though renderings for the project have just been released, the Xinhee Design Center is currently under construction and is expected to be operational sometime in 2017. The Chicago office of SOM recently completed a 55-story tower—called the Beijing Greenland Center—in the Dawangjing business district of Beijing. The mixed-use project is clad in a trapezoidal facade that's meant to catch and reflect daylight in the often overcast city. The Beijing Greenland Center is comprised of Class A office space and 178 apartments on top of a multi-story retail podium. 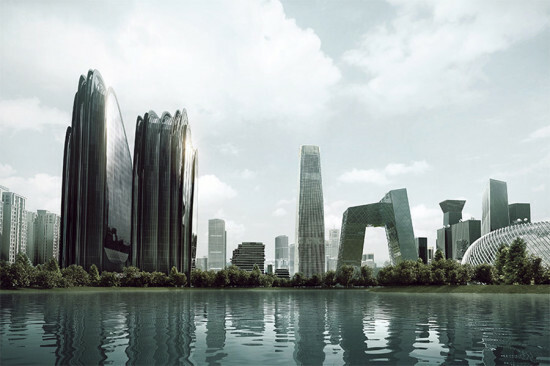 SOM was also responsible for the masterplanning of the Dawangjing business district. 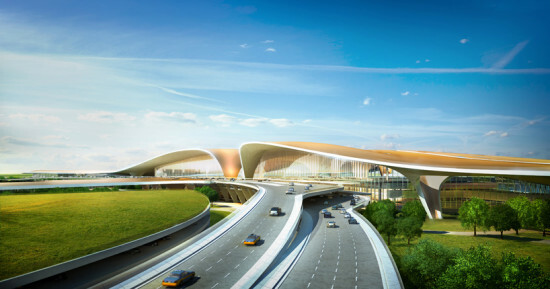 The mixed-use development is located between Beijing's historic core and the Beijing Capital International Airport, northeast of the city. 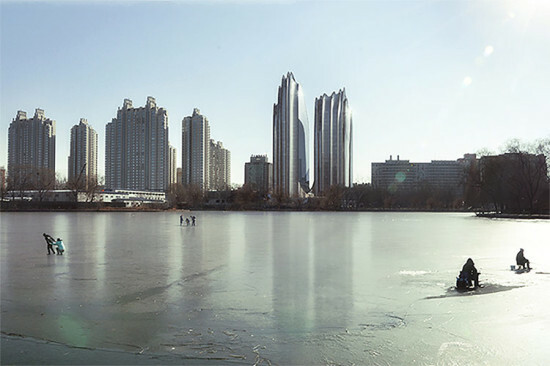 Along with the Beijing Greenland Center, SOM has also designed several other towers for the district. 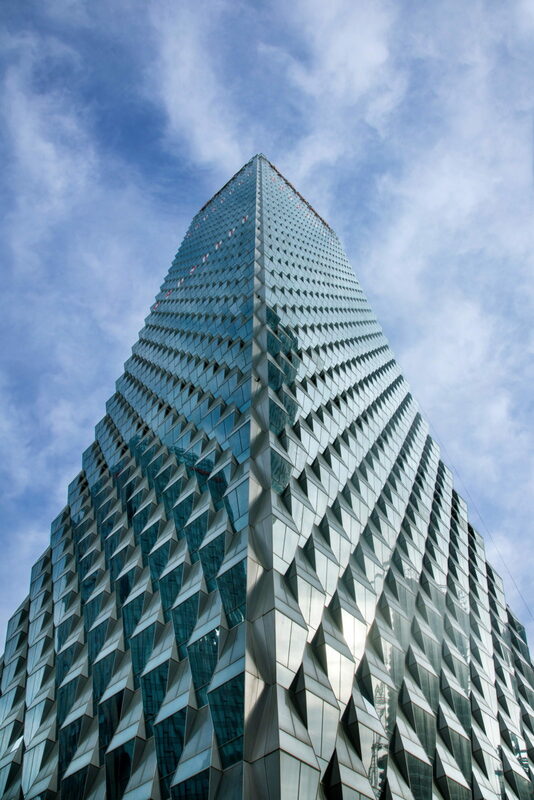 The tower’s trapezoidal skin is part of building’s sustainability systems. The undulating trapezoids provide self-shading on all sides of the building. Other sustainable systems include a Direct Digital Control building automation system, a heat reclaim wheel, and water-side economizer to utilize evaporative cooling. These systems account for an estimated 30% reduction in energy use and water consumption compared to baseline. 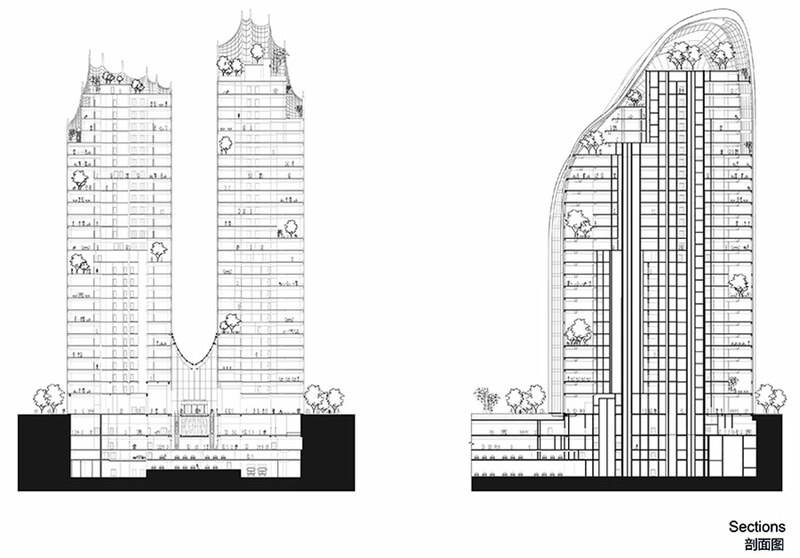 In designing the facade of the new Waldorf Astoria Beijing, Chicago-based Adrian Smith + Gordon Gill Architecture (AS+GG) set out to create a contemporary expression that maintained a relationship to the city’s historic context. The project, after all, is within walking distance of the Forbidden City and many of the Chinese capitol’s famous Hutongs. “How do we make the experience of going to a hotel special and what about it would be Chinese?” enquired founding partner Gordon Gill. “From an experience standpoint, what about the wall could change your experience in your room?” The answer was a bronze facade with a bay window system that protrudes out from the face of the building. The bay windows are not uniform, however, but tuned to differing angles and orientations to frame particular views. This makes the whole building “like a compound eye,” according to Gill. Working in co-ordination with Toronto-based Yabu Pushelberg, the interior architects, the team developed a modular system based on the size of the rooms and the dimensions of the structural bays. It led to a cleaner design that was easier to construct. 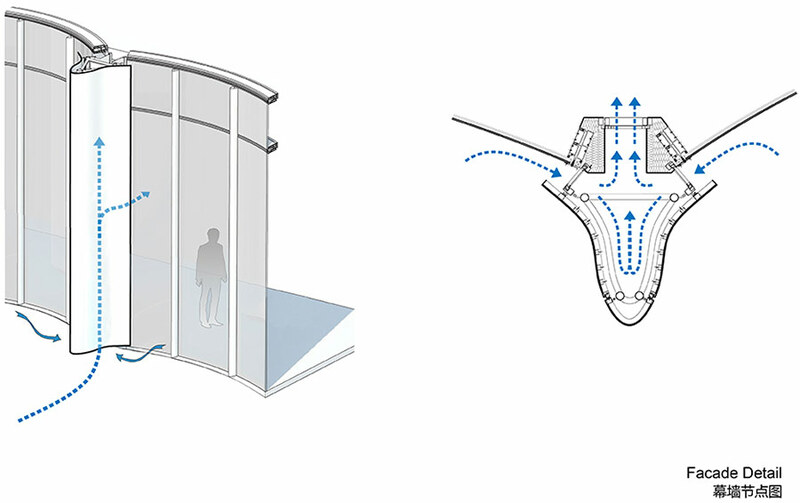 While the texture created by the bay window system is ornamental and connected to the context, it also provides solar shading. Shade provided by horizontal glass fins above the recessed vertical windows allowed the architects to use very clear low-iron glass to give the best views possible. “It is not tainted by a tint or a color in any way. There is a low-e coating on the glass, but it’s a low-level so it’s not reflective on the inside,” said Gill. The architects developed the bronze details, and the client initially liked it. The designers were excited, but nervous about it actually happening. Gill explained, “We went back to the chairman a few weeks later for the presentation, and he came back and said ‘Well I want you to know that I had lunch with the mayor and I told him that this building was going to be bronze, and he loved it, so now we have to do it.’ So it was just a matter of detailing out.” Metal panels can present technical challenges, especially catalytic failure between the z-clips and the metal panels, including rusting, corrosion, or telegraphing through the panel. The design team mitigated these problems, so the main challenge was to get the color right. Bronze is not a typical material, so they had to rely on their own blend of copper, nickel, and brass to achieve a warm, golden color that was not too yellow, red, or brown, but somewhere in between. 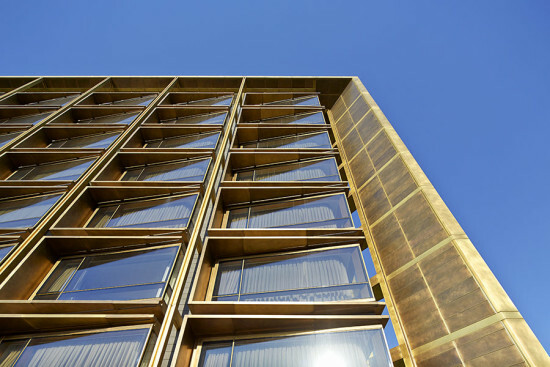 There is variation from panel to panel—an unpredictability that adds to the texture and richness of the facade. The unusual material was inspired by two large bronze pots at a nearby historic hospital building, which the client had referenced. This decision exemplifies the ethos of the building, which was to capture the elegance and quality of Waldorf Astoria’s brand in contemporary yet contextually sensitive building. It has come to serve as an example to luxury hoteliers around the world. Scientists' dire warnings about climate change have become as routine as they are shocking. As global temperatures shatter records and extreme weather events rip across the planet, climatologists have continued to issue study after study about how bad things are and how much worse they will get. For years, we've known that coastal cities are threatened by rising sea levels, but now there is even more bad news for those living in populated urban centers—whether they're near the sea or not. It's called the "climate penalty" and it could transform urban living. According to the New York Times, scientists are warning that a warmer planet will mean smoggier cities. “Ozone is a key culprit,” explained the Times. “This lung-damaging compound, often formed from chemical reactions involving sunlight and automobile exhaust and other pollution, plagues major cities around the globe. 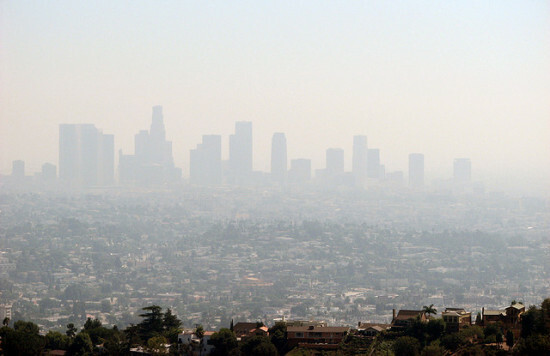 As the climate heats up, it is projected that more ozone will form in polluted areas on sweltering days.” While the climate penalty could have serious health impacts for city dwellers, sparsely populated places of the globe could actually see a slight improvement in air quality; that’s because higher temperatures increases the amount of water vapor in the air, which can separate ozone particles. 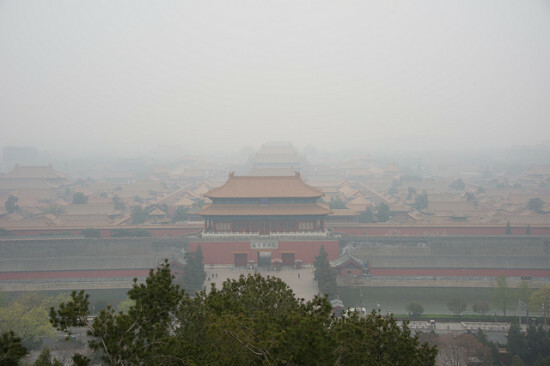 News of the "climate penalty" comes shortly after a report found that Beijing will be covered in smog for the next 16 years. The air in Beijing, China is dirty, and a new report suggests it won't be getting cleaner any time soon. Beijing residents received the grim news from the Beijing Municipal Research Institute of Environmental Protection regarding the city's air pollution levels. Following studies done by the institute, researcher Pan Tao has estimated the return of safe air pollution levels in 2030. The World Health Organization has stated in the past that the concentration of PM2.5, particulate matter with a diameter of 2.5 micrometers or less per cubic meter, should not exceed 35 micrograms per cubic meter. In 2013, however, the level of PM2.5 in Beijing measured 89.5 micrograms per meter. Tales of Two Cities: New York & Beijing Bruce Museum 1 Museum Drive, Greenwich, CT Through August 31 The Bruce Museum’s newest exhibition examines two of the world’s greatest art capitals: New York and Beijing. 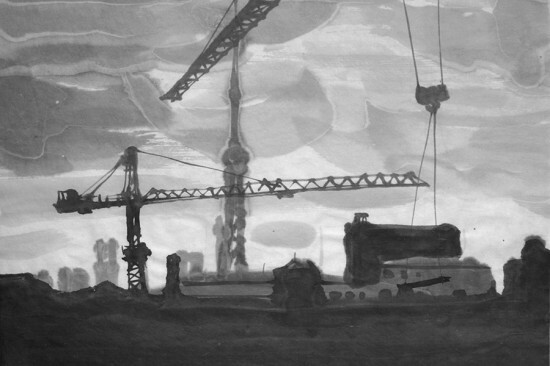 The show compares works by five New York–based artists and five Beijing-based based artists. The ten creators have been engaged in five different global, cross-cultural, artistic dialogues over the course of two years via email, Skype, and in person, sometimes with translators, about issues ranging from political and social upheaval, the concept of global culture, and questions about materials and techniques. The exhibition consists of new and existing works along with two site-specific pieces. The concept for this show grew out of a 2010 collaboration between New York artist Michelle Fornabai and Beijing artist Qin Feng, which was curated by Pan Qing at Columbia University’s Studio X. Both artists are featured in the Bruce Museum show. The curators matched the artists based partly on the kind of work that they do and their artistic processes, but more importantly on the type of dialogue in which they suspected the artists might engage within the context of their respective urban environments. Many of the ten artists are themselves on the move between global art centers, not only New York and Beijing, but also in Latin America and Europe. The Council on Tall Buildings and Urban Habitat, the nonprofit arbiter on tall building design, has named its 2014 picks for best tall buildings. Among the winners are a twisting tower in Dubai, Portland's greenest retrofit, and a veritable jungle of a high-rise. The four regional winners are: The Edith Green-Wendell Wyatt Federal Building, Portland, USA (Americas); One Central Park, Sydney, Australia (Asia & Australia); De Rotterdam, Rotterdam, Netherlands (Europe); and Cayan Tower, Dubai, UAE (Middle East & Africa). Portland’s Edith Green-Wendell Wyatt Federal Building is not a new building. Designed by SOM in 1974, the office tower used a pre-cast concrete façade that had begun to fail by the turn of the 21st century. Bainbridge Island, Washington-based Cutler Anderson Architects and local firm SERA modernized the 18-story, 512,474 square-foot structure that is now targeting LEED Platinum. 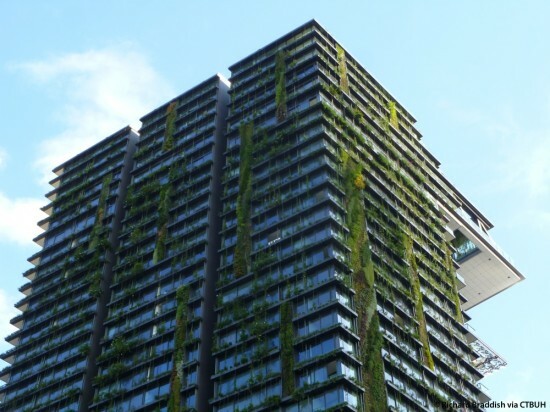 One Central Park in Sydney uses hydroponics and heliostats to cultivate gardens and green walls throughout the tower, cooling the building and creating the world's tallest vertical garden. OMA’s De Rotterdam is the largest building in the Netherlands, and its form playfully morphs the glassy midcentury office high-rise in a way that’s part homage and part experimental deconstruction. In the Middle East, Dubai’s twisting Cayan Tower (formerly The Infinity Tower) is a 75-story luxury apartment building that turns 90 degrees over its 997-foot ascent. Remarked the CTBUH panel: “happening upon its dancing form in the skyline is like encountering a hula-hooper on a train full of gray flannel suits.” CTBUH will pick an overall “Best Tall Building Worldwide” winner at their 13th Annual Awards on November 6, at the Illinois Institute of Technology in Chicago. Their panel of judges includes Jeanne Gang, OMA’s David Gianotten, Laing O’Rourke’s David Scott, and Sir Terry Farrell, among others. 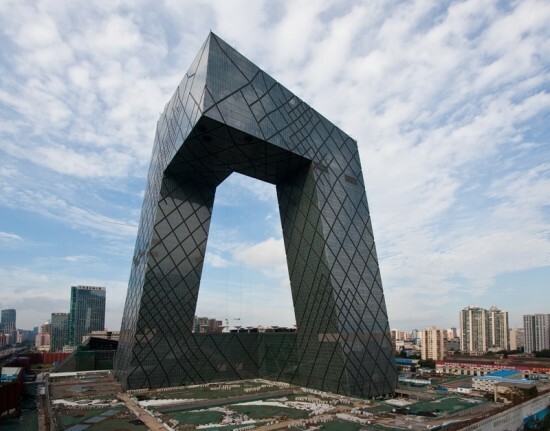 OMA’s CCTV Tower in Beijing won last year’s competition. Most of the 88 contest entries were from Asia, CTBUH said, continuing that continent’s dominance of global supertall building construction. CTBUH's international conference will take place in Shanghai in September. You can find more about the 2014 CTBUH awards, including a full list of finalists, at their website. 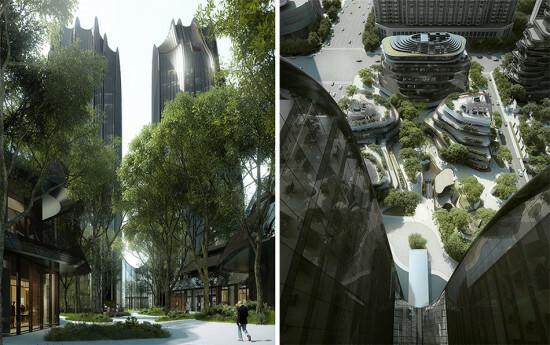 Nearly two years after preliminary discussions and planning, the Chinese studio MAD has set their project “Urban Forest” into motion, breaking ground in late April. Led by renowned architect Ma Yansong, MAD architects intends to transform the city of Beijing, China by erecting eco-friendly buildings—called Chaoyang Park Plaza—in the shape of natural landscapes commonly found in Southeast Asia. All renderings courtesy MAD. 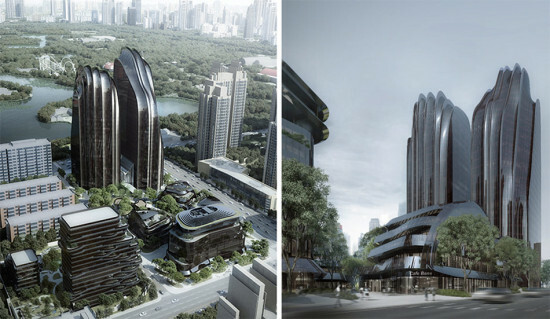 According to the architects, "Like the tall mountain cliffs and river landscapes of China, a pair of asymmetrical towers creates a dramatic skyline in front of the park. 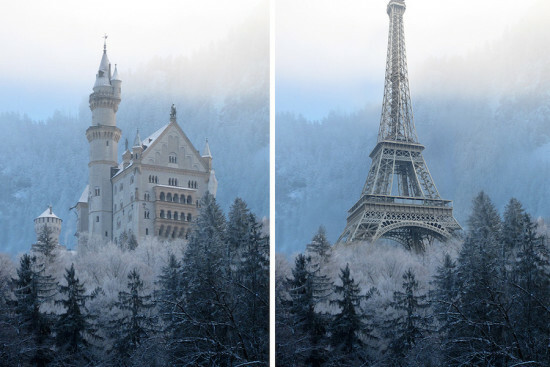 Ridges and valleys define the shape of the exterior glass facade, as if the natural forces of erosion wore down the tower into a few thin lines." The Chaoyang Park Plaza, in Beijing's central business district, hopes to re-imagine the urban landscape of Beijing by bringing the striking forms of the towers together with lush landscapes pulled in from the adjacent Chaoyang Park. The development is expecting to received a LEED Gold certification from the U.S. Green Building Council when the project is completed in 2016.